Feeling a little out of this world? Want to show off your electric personality? 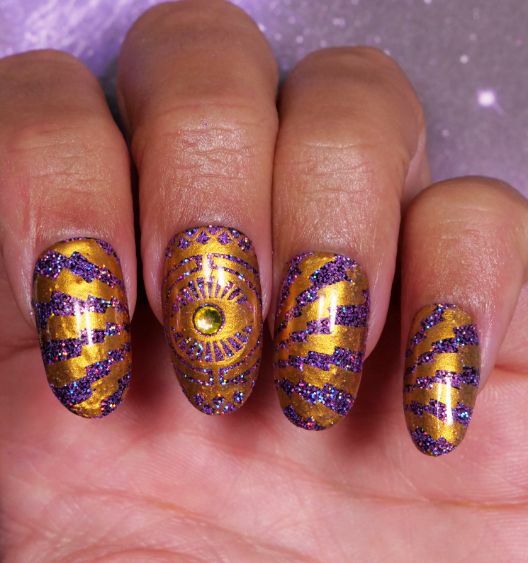 This purple and gold stamped manicure packs a pretty punch. Stamped designs work well for beginners because the stamper is easy to hold and transfers a precise design without the need for a fine detail brush. To achieve this dramatic look, you’ll need a dark base color. Black gel polish makes the purple glitter look more intense. Once it’s set in place, the metallic gold will give the design a dose of drama perfect for Mardi Gras or any celebration. Remember to clean your stamping tools thoroughly after each use to keep them in tip-top condition. 1. Press the stamper against the sticky-tape lint roller to remove any leftover paint. 2. Apply two coats of black gel polish to nails, curing between coats with the UV or LED lamp. 3. Apply latex tape peel-off cuticle guard to the skin around the nails and let it dry. 4. Apply easy-off gel base coat to the nails, and cure them with the lamp. 5. 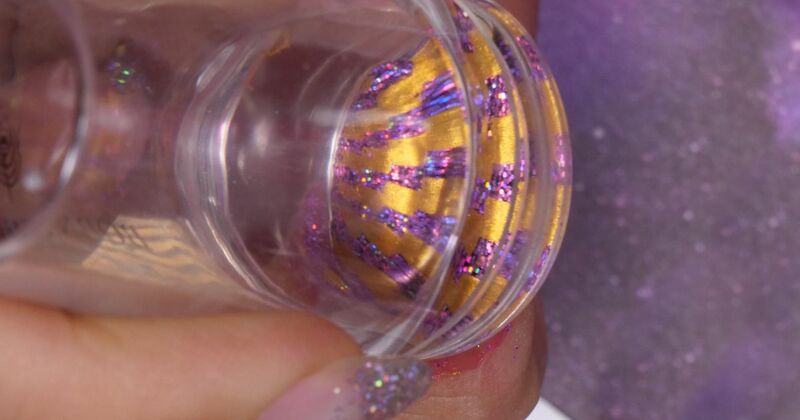 Dip the fluffy brush into the purple glitter and gently pat it onto the nails. Cure the nails with the lamp. 6. Apply no-wipe matte gel top coat to the nails, and cure them once more. 7. Apply gold metallic stamping gel paint to the stamping plate, and use the scraper to press the paint into the design. 8. Press the stamper onto the paint to transfer it, and stamp your nail. Repeat until all of your nails are stamped. Cure them with the lamp. 9. Clean the stamper by pressing it onto the sticky-tape lint roller. 10. Apply soak-off sealer gel to the nails, and cure them again. 11. Peel off the cuticle guard with tweezers. 12. Clean the stamping plate and scraper with acetone and a soft cotton pad.